Manned entirely by volunteers, British and American submarines saw action in every maritime theatre during the great conflict of 1939-1945, the crews fighting their solitary, stealthy, secret war with courage and nerves of steel. 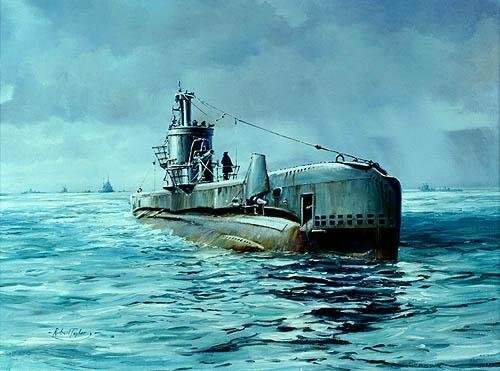 Robert Taylor's evocative painting Secret Operation captures the menacing beauty of a submarine on the surface: the S-Class type H.M.S. Sceptre slips her moorings in Scapa Flow, Scotland, and glides quietly into the North Sea to begin another top secret underwater operation. On the conning tower the skipper takes a final look across the water to the distant highlands while crews below savour the fresh salt air knowing soon they will submerge into their eerie, silent, artificial world, beneath the waves. Overall Print Size: 17" x 19"
Each print is individually signed by the artist and FOUR Royal Navy Captains of World War II.